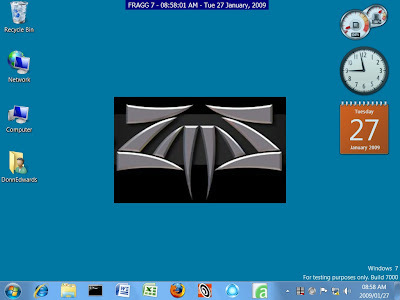 I downloaded and installed the public beta of Windows 7 on FRAGG, my test computer for defrag programs. It seems stable enough, and runs most of the test utilities that I plan to use on Windows Vista. There are a number of programs lined up for testing, which should begin in the next few days. I have just got to figure out how to use hIOmon, the file I/O performance monitor, which I think will be of great help in figuring out how well the system is performing under different file usage scenarios. FRAGG will now be able to run tests using Windows XP Professional, Windows Vista Home Basic, and Windows 7 Beta. I have purchased a few benchmarking programs, and downloaded a number of free ones, so we are nearly set to go. I have installed a whole bunch of programs on each OS, and then made a sector-by-sector image of each, complete with full Recycle Bin, browing history, and no defragmentation whatsoever.